Create a spa-like getaway in your home with shower installation from AVS Plumbing & Heating. It used to be that shower heads and faucets were standard, run-of-the-mill items that were more for function than beauty. With the fascination with home design and renovation consistently on the rise, all of that has changed. Today, showers are being transformed from boring to amazing. If bathroom renovations are in your future, we can help. AVS Plumbing & Heating can help you create your ideal, spa-like bathroom. With access to the finest products on the market and expert installation, your new bathroom can become your very own private oasis. If you’re happy with your bathroom, but are in need of either shower or faucet repairs or replacement, we can help there, too. We’ll visit your home, evaluate your issues and recommend that repair or replacement that is right for you. Moen plumbing products are widely known for their superior form and function. Moen is among the best in the industry at developing new and beautiful innovations. Most certainly, they are at the forefront of design and functionality when it comes to their shower products. Always on top of the latest trends, Moen offers consumers a variety of choices to match any style and decor. AVS Plumbing & Heating services Howard County and Carroll County in Maryland. 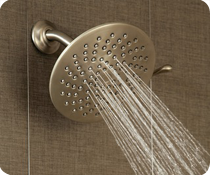 To find out more about shower and shower head installation and plumbing services, contact us today at 410-442-2221, or click the button on the left to schedule service. Moen offers a huge selection of bathroom faucet and show head options. With cutting edge designs to match any home's decor, Moen is sure to have bathroom faucet and shower products you'll love. Kohler is a leading manufacturer of many plumbing products including high quality toilets. Style, efficiency and a product that will last for years to come. Ask about the Kohler toilet products we carry. If you're looking for style when it comes to bathroom, kitchen and bar faucets, you'll want to check the products available from Delta. A leader in faucets for decades, Delta faucets deliver.